Parish Hill Creamery is a family endeavor drawing on Peter Dixon’s 35 years of cheesemaking and consulting experience. With his wife Rachel Schaal and sister-in-law Alex, as well as the apprentices and children, Peter is orchestrating the fermentation and transformation of excellent milk into beautiful and delicious cheese. Parish Hill cheese is the expression of raw milk from Elm Lea Farm, at The Putney School, into the hands of the cheesemakers, with creamery propagated cultures, traditional rennet, and hand harvested sea salt. Elm Lea Farm milk is the result of healthy animals grazing on lush pastures. Protein and fat are balanced ideally for the cheeses Parish Hill produces, and the cheese changes subtly throughout the season, reflecting the growth and maturation of various pasture plants. This alchemy of make and age called cheesemaking takes place in the village of Westminster West, Vermont. Everything is done by hand, from pick-up at the farm, to fermentation and flocculation in the vat, to hooping, to salting, to flipping and washing, brushing and hanging, and ultimately readying for market. 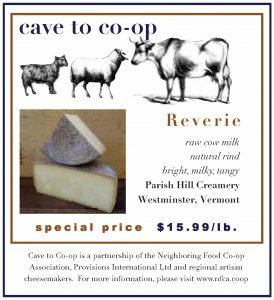 Reverie is a traditional, semi-hard Toma, with a bright milky flavor and slight tang when young, becoming sharper and more robust with allium notes, as it ages. Wild molds are encouraged and the rind resembles gray stone. Reverie is aged at least 5 months. Delicious as a table cheese and on a cheese plate, Reverie can also be used to make some pretty delicious food. Try these recipes on your Thanksgiving table. Put the Brussels sprouts in a shallow baking dish that will hold them in a snug single layer (a 9×13-inch rectangle or slightly smaller oval is good). Toss with 2 T of the melted butter, ¾ t salt, and several grinds of pepper. Spread them evenly in the dish and roast, tossing once or twice, until browned in spots and tender when pierced with a knife, 25 to 30 minutes. While the sprouts roast, combine the breadcrumbs with the remaining Tbs. melted butter and 1/8 t salt in a small bowl. Mix in the Reverie. When the Brussels sprouts are tender and browned, pour the cream over them and continue baking until the cream has thickened to a saucy consistency and coats the sprouts, 5 to 7 minutes. Remove the pan from the oven. Set the oven to broil and position a rack to 6 inches below the broiler. Sprinkle on the breadcrumb mixture. Broil the gratin until the crust is deep golden brown, about 5 minutes. Boil the potatoes with the bay leaves until the potatoes are tender. Drain the potatoes well and discard the bay leaves. Using a potato masher, mash the potatoes by hand, and then stir in chunks of butter and shredded Reverie. Cover and set aside to let cheese melt. Stir in heavy cream, season with salt and white pepper, then beat until creamy using an electric beater. Transfer to serving dish and garnish with chopped chives. Rub the potatoes with the olive oil and season with salt and pepper. Bake, cut side down on a rimmed baking sheet until golden brown and tender, between, 18-25 minutes, depending on the size of the potatoes. Turn the oven to broil, combine the cheeses in a small bowl. Turn the potatoes cut side up and top with the cheese mixture, dividing evenly. Broil until cheese is melted and golden brown. Serve warm. In a large bowl, combine the apples, celery and pecans and gently mix in the maple mayonnaise and then the cranberries and cheese. Serve chilled.